Welcome to Club Read 2015! We are a group of serious readers who are varied and thoughtful in our reading and would like to log/journal publicly our 2015 reading and follow what others are reading. Please take a look around to see if we're the kind of readers you'd like to hang with. Many of us have been together on earlier versions of Club Read, but we always welcome new readers! This year, once again, volunteers have offered to set up and manage some of our regular threads, including monitoring the What Are You Reading? (lilisin) and Interesting Articles (Kay/RidgewayGirl) threads to make sure they get continued when they get too long, and quarterly and year-end Best Reads threads (Colleen/NanaCC). 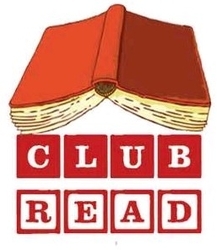 Thank you all, and thanks to Edwin for the new Club Read 2014 logo. Literary Centennials, a group for celebrating the 100th, 200th, etc. birthdays of major authors by reading their works. Reading Globally The quarterly theme reads for 2015 are the Indian subcontinent, the Iberian peninsula, Nobel prize winners who didn't write in English, and women authors who didn't write in English. 1914-2014: Commemorating World War I: Book Discussions This is the thread in the 2015 group, and includes a link to the original 2014 thread.